Had to run some errands today and noticed water coffee in the local mini mart (picture center). I haven’t seen it before and it made me think about the types of drinks that people like. In Taiwan and China, for example, bottled tea is very popular. 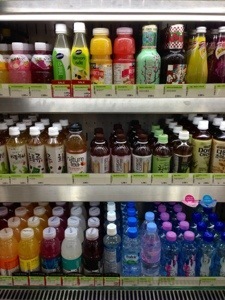 Sadly there aren’t many choices for bottled tea in Korea. There’s the American sweetened variety, the diet type for slimming, and barley tea. However, Koreans do love their coffee and there’s at least one coffee shop on every block. This entry was posted in Food and tagged barley, coffee, mini mart, Tea by easykorean. Bookmark the permalink.